With Elevate™ wrist heart rate technology³, you can ditch the chest strap and measure heart rate from the wrist for all your sports except swimming, where optical heart rate isn’t available. 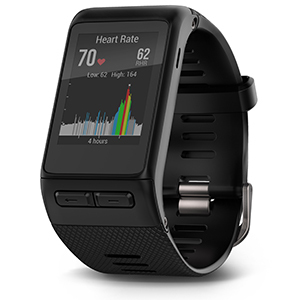 Using heart rate data, vívoactive HR provides calories burned information and quantifies the intensity of your fitness activities, providing better credit for your efforts. 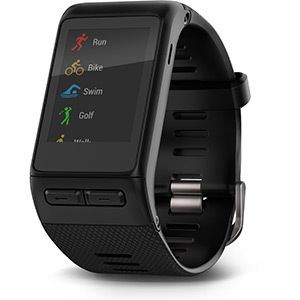 Run, bike, swim, golf, ski and more with vívoactive HR. 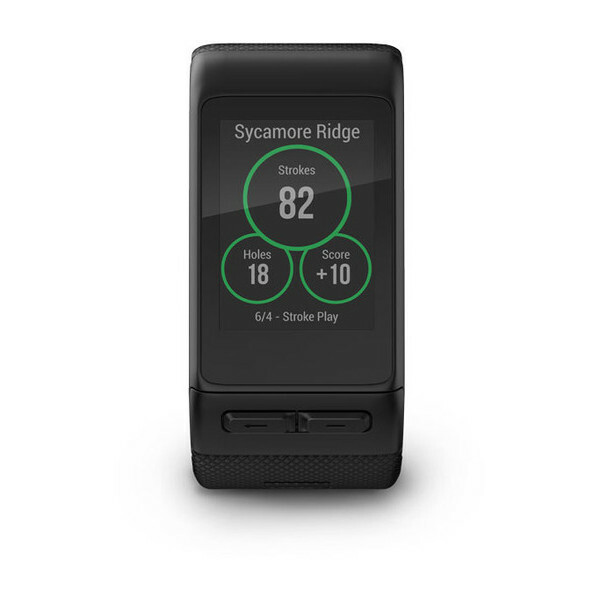 Its GPS-enabled built-in sports apps track your stats while smart notifications allow you to stay connected — all so you can keep your life in balance. vívoactive HR continues to track activity³ throughout your day by counting steps and floors climbed as well as monitoring sleep and calculating intensity minutes. You won’t have to worry about this watch keeping up with you. 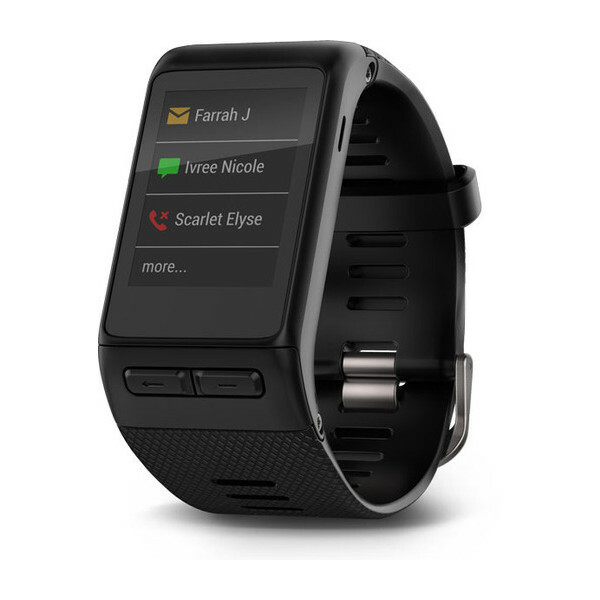 The rechargeable battery lasts up to 8 days² in watch/activity tracking mode or up to 13 hours using GPS. 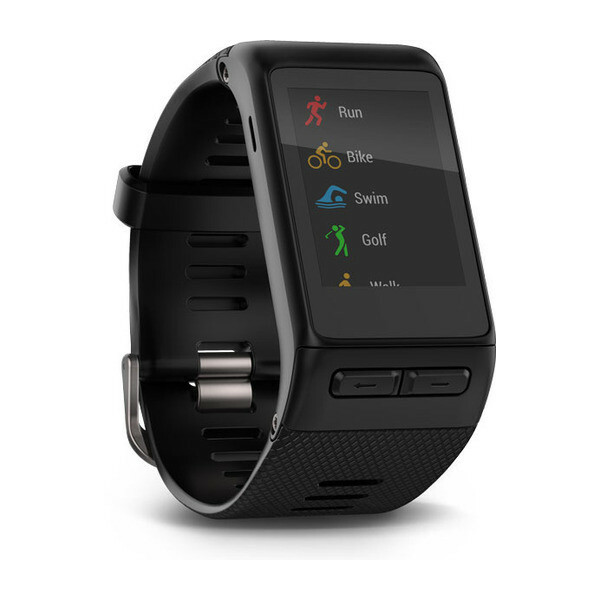 Throughout your day, vívoactive HR automatically syncs¹ to Garmin Connect. Garmin Connect is the only free app that gets to know you and then delivers the insights to help you beat yesterday. These include cues to move if you’re not on track to meet your step goal — or shoutouts when you do hit those milestones. Plus, you’ll get healthy tips from experts that become like virtual coaches. 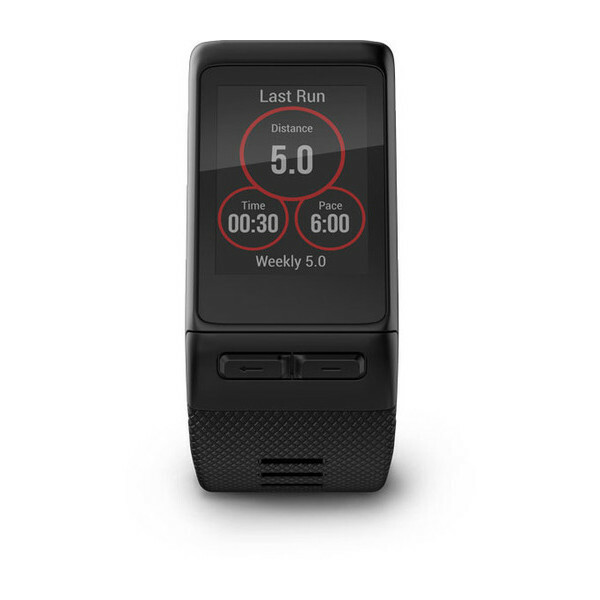 Using its built-in accelerometer and GPS, vívoactive HR allows you to run both indoors and out. 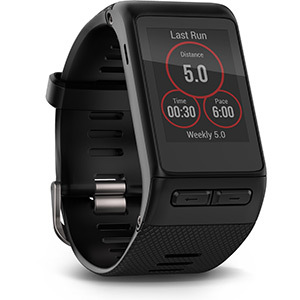 You can set up vibration alerts for heart rate, pace, run/walk intervals and more. Other training features include Auto Lap® and Auto Pause®. Provides post-run summary with stats such as total mileage, calories, average pace and overall time. The GPS-enabled cycling app measures time, distance, speed and calories. It’s compatible with sensors4, such as speed and cadence, to measure your progress on training rides as well as daily commutes; also compatible with Varia® lights and radar for safer riding. Hit the pool’s lap lanes and see detailed stats like total and interval distance, pace, stroke count, stroke type5 and more. Let the swimming app calculate your efficiency with swolf, which adds the time and the number of strokes it takes to swim a pool length. Interval Count lets you seamlessly pause and then resume your workout. At the end of a workout, view your summary data, which includes interval and session averages, overall time and personal records. Play new courses every day by downloading 1 of 40,000 course maps worldwide from our golf course database. The golfing app can show a simplified view of the green and help you track your score, letting you see if you’re under or over par. If you like to paddle board and row — indoor or open water — the built-in paddle boarding app tracks and displays all your stats. See pace, overall time, distance and stroke all at a glance when out on the water or in the gym. For a day of skiing or snowboarding, vívoactive HR measures your 3-D speed by calculating the speed and distance on an incline versus latitude and longitude. It also provides your splits automatically and gives you the option to turn on Auto Pause, which freezes the timer automatically when you stop or ride the lift. vívoactive HR gently vibrates to alert you to all the same notifications you receive on your compatible device¹ — from phone calls to social media alerts to other alerts from mobile apps. vívoactive HR also displays weather information, temperature and more. Additionally, it lets you control the music on your phone, locate your phone1, remotely control your VIRB® action camera and let your friends and family track your activities in real time with LiveTrack. 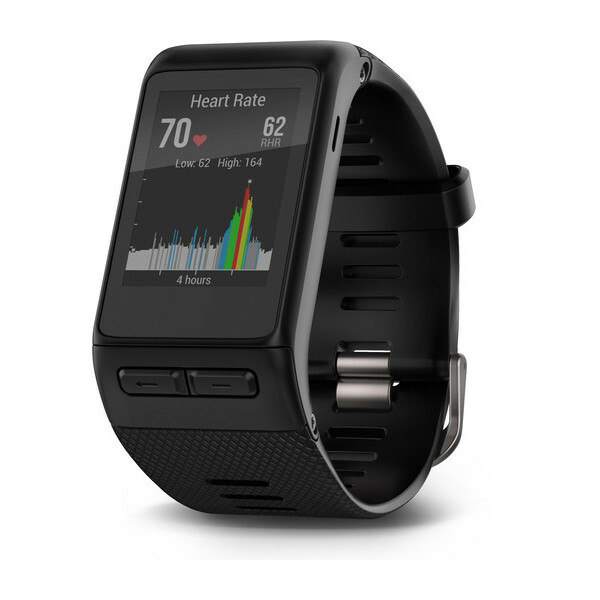 Personalize vívoactive HR with custom watch faces, data fields, apps and widgets from our Connect IQ™ store. 5Swim features are designed to work for the 4 recognized competitive swim strokes. 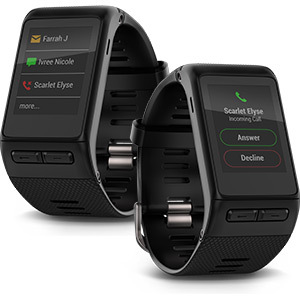 The Bluetooth® word mark and logos are registered trademarks owned by Bluetooth SIG, Inc. App Store is a trademark of Apple Inc. Google Play is a trademark of Google Inc.